Our number one priority is to provide the most reliable, precise, and productive machines to ensure the long-term efficiency and profitability of our clients. We provide a wide range of manufacturing of fabrication machinery, for efficient processing suitable for a range of industries. We can manufacture multiple machine types for compression, and sliding wiper bending processes, rotary draw, push, and mandrel bending equipment. . In addition, machines can incorporate in line secondary operations such as piercing milling, drilling, and coping, all in manual or automatic operation controls. Equipment is built to customer specifications, tailored to fit specific applications. Peripheral equipment such as autoloaders, conveyors, pick and place units, and other devices can also be combined into custom machinery. A manually-operated brake from Eastern Tool lets you make boxes and pans that you couldn’t create with a straight brake. Thanks to heavy steel construction, these box brakes will remain accurate over a lifetime of use..
No matter the type or capacity, our sheet metal shear makes perfect cuts every time. What’s our secret? Exacting research and development plus high-quality materials. Sheet metal rolling equipment is used in the metal fabrication industry to roll sheets and strips. These machines are useful to get the perfect curve radius without any design flaws. 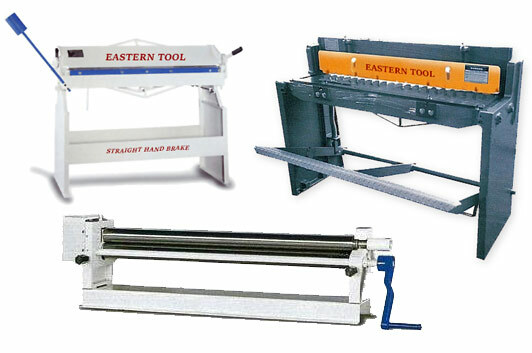 Eastern Tool’s machines are ruggedly built to make the job of rolling metal so much easier. You can count on a our sheet metal notchers to make crisp corners, ready for welding. With their durable steel or cast iron construction and adjustable guides, these machines will give you years of clean, repeatable results. Our pipe fabrication inventory consists of an assortment of simple, easy to use, and long-lasting equipment. From hand pipe benders and hydraulic notchers, we have all the products to meet your requirements. Our Roll & Angle Benders are used to bend sheet metal and profile shapes. These machines handle mild steel, stainless steel, aluminum, titanium, bronze, brass, copper as well as other alloys. Available in different sizes, from small and portable to larger heavy duty options. Complete your sheet metal fabrication work with an Eastern Tool press brake. We provide a variety of sheet metal press tools that can meet your needs. Our press product range includes hand operated, hydraulic, and electric hydraulic presses. With our presses, you can shape, punch, and stamp metals of various sizes. They are also capable of working with metals of various thicknesses. © Copyright 2017 Eastern Tool Incorporated | All Rights Reserved.